This approximately 1.5 hour long tasting tour provides you with 8 to 10 samples from 8 of Portland's best food carts! Taste Portland Tours has eaten at just about every food cart downtown to select 8 of the very best that are pushing the envelope of what delicious can be. 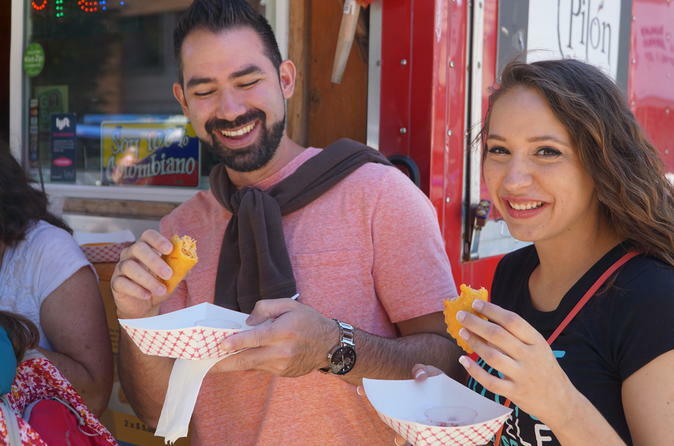 Our expert local guides provide an entertaining insider’s view into the culture and story behind each food cart, tying it together with the wonderful tastings we enjoy. In fact, we often refer to the largest Food Cart Pod as “The United Nations” because it looks like a little UN meeting with snacks before the meeting! Together we’ll visit the cuisines of Colombia, China, Mexico, Italy, Vietnam, Germany, Korea, Syria, France, and one little tiny island, Mauritius. And we made special deals with all of the owners so you get to skip the lines, too. We cannot accommodate people with extreme food allergies, like gluten allergy. Next you'll depart on foot, walking 1 block to the 1st food cart pod to sample two different food carts there, one Colombian and one French. After that, at approximately 2pm you'll head 1 block over to the 2nd food cart pod to have 2 samples, one Chinese and one Mexican. Then we'll head 3 blocks over to SW 5th Avenue to the 3rd distinct food cart pod to have 2 samples, one African and one Korean. Next up we'll do a bit of history while we digest, stopping into the lobby of a beautiful hotel named after it's founder around the turn of the 20th century. As we walk your guide will also point out some of Portland's best cafes and restaurants. Finally, around 2:40pm we'll arrive at the 4th food cart pod on our tour, the biggest in Portland, with over 30 different food carts assembled on a block and a half of real estate. At this final sample the cuisines of Italy, Germany, Vietnam and Syria.